Decision to admit to the SCO another two states, India and Pakistan, was made at the summit held last year in Ufa. Russian President Vladimir Putin said the admission of India and Pakistan to the Shanghai Cooperation Organization (SCO) will make the SCO a more powerful, influential and popular association in the region and worldwide. "Indeed, as the Shanghai Cooperation Organization expands its areas of operation and its membership through the participation of the powerful countries I have just mentioned [India and Pakistan], it turns into a very powerful international association that commands respect and is relevant both in the region and worldwide," Putin said in an interview with China’s Xinhua news agency prior to his visit to China. "At the summit held last year in Ufa, Russia, we decided to admit to the SCO another two states, India and Pakistan. We are to formalize this decision at the Tashkent meeting [due June 24]. We will also consider the intentions of other countries to join our work," he said. "The international environment is complicated and multifaceted, and issues are not resolved by the mere fact that countries with different approaches to and views on various international challenges join our Organization. However, as we expect, their accession does create conditions for the issues to be resolved," Putin said. "This Organization, when it was first created, set itself quite modest goals, which I would say were important but at the same time practical. These included the settlement of various issues of cross-border cooperation, complex as well as simple ones," he said. "As we know, such border issues may remain in limbo for decades if goodwill is lacking, and are promptly settled when there is enough goodwill. This most likely depends on the mood, on the philosophy adopted by a state in its international relations," Putin said. "It is thanks to this very goodwill that Russia and China, as well as other members of the Shanghai Cooperation Organization, have fulfilled the tasks they set themselves in this area. We came to understand that such a mechanism, along with its valuable outputs and the level achieved in relations between our countries, should not be wasted," he said. "Therefore, we actually began using the established mechanism to address other issues, first of all developing our cooperation in various areas, such as political cooperation and cooperation in infrastructure development. 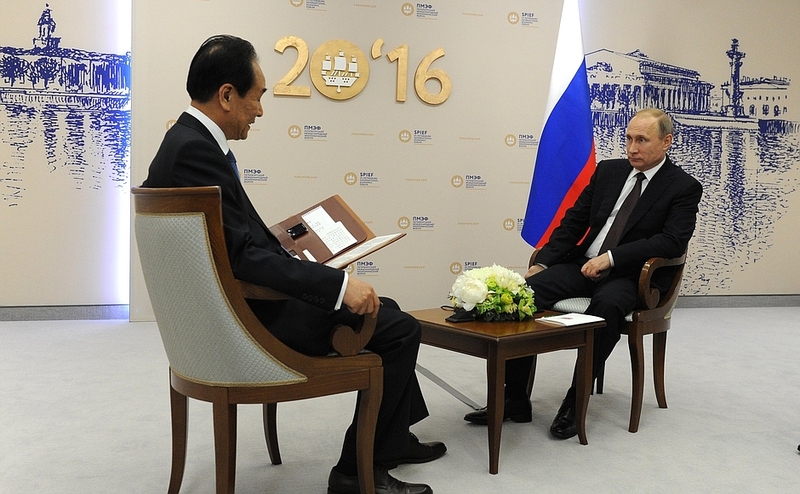 We also launched discussions on security, on combatting the drug threat and other issues," Putin said. "I would not say that we have made astonishing progress or carried out any high-profile activities; yet the Organization has become highly demanded and attractive in the region, and many countries of the world have expressed their willingness to join it," the Russian leader stated.